A movement is building momentum in the nation. View an example of it here. 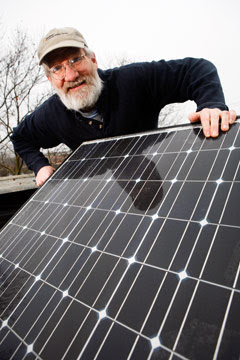 If you haven't read Gerald Britt's weblog, Change the Wind, you need to. His reflections on the Obamas are profound, no matter what your political position or preferences. You need to read what he says! 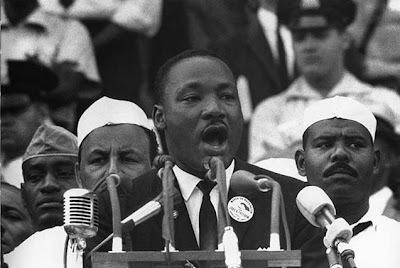 I was just 13-years-old when he delivered arguably the most famous and significant speech in the nation's history. Yesterday marked the 45th anniversary of the poor people's march on Washington, the location of Dr. Martin Luther King's address. Dr. King spoke often of the "beloved community." He knew what we experience and prove up every day here in inner city Dallas. We all need each other. We're all connected to one another. What adversely affects the one, hurts the rest. When one neighborhood struggles or fails, all other neighborhoods are damaged whether immediately felt or recognized or not. His speech is a gift to us all. Everyone should listen to this speech at least once a year. And just when I was certain that I'd heard and seen just about everything related to poverty and homelessness in the U. S., along comes University of Michigan student Stephen Mills. 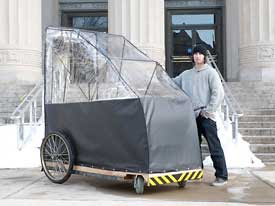 HUVs for our homeless (as in "homeless utility vehicles")? Maybe Mills is just facing some hard facts about how difficult it is for communities to find the will to put an end to homelessness. As final-year art projects go, Stephen Mills' was a little unusual. Most every art-and-design senior at the University of Michigan was pulling together a thesis that involved a painting, a statue or something more conventionally artistic. He designed and built a shelter on wheels for homeless people. With all its funding now in place, a project to bring low-income housing to downtown Dallas is moving toward occupancy by next spring, leaders of the effort said today. “It’s good for us to know that it’s really going to get built,” John Greenan, executive director of the Central Dallas Community Development Corporation, told an audience gathered in the cavernous, bare-walled ground-floor space of what will become City Walk at Akard. There, at 511 N. Akard St., workers are transforming a 15-story office building, vacant since the early 1990s, into offices, retail space and 205 residences, 50 of which will be reserved for the formerly homeless. Beginning assumptions often determine results and outcomes. This is especially true when it comes to how we decide to regard people. When I begin with a worldview defined and informed by the categories and parameters of judgment, I quickly head in a direction that expects very little of others in their current state and assumes the necessity of my presence to affect the much needed change that I find so obvious. Such a perspective creates the illusion that occupy a position of superiority, power and dominance. While shrouded in the false nobility of moral obligation, a worldview dominated by judgment cuts me off from authentic relationships. Such a stance weakens and, ultimately, destroys community. If on the other hand, I enter every relationship as a fellow traveler involved in a quest for hope, the outcomes turn in a completely different direction. Assuming the position of peer, partner and prospector, I now can join others in the quest for hope and the renewal it always delivers. The honest seeking of hope frees me to approach others with high regard and limitless expectations as they face their own futures. At the same time, hope allows me to reach out to fellow travelers for help, assistance and partnerships. Freed from the undue sense of being a "required presence," I can find the space I need to fall naturally into unexpected, but vastly rewarding friendships and connections. In the process, community is strengthened and given new life to see the beneficial cycle repeated again and again. I've seen this choice worked out often over the last 14 years in the city. The direction we choose, the worldview we adopt will determine our ultimate destiny and destination, as well as our practice. Real progress. . . at last! At some point soon I'll probably post in detail about the unbelievably complex and difficult process that we've been through to finally close the construction loan on our 15-story building in Downtown Dallas. To learn more about our project you can use the "Search" tool here: just type in "citywalk@akard" and you'll be able to get the background. The closing process with all of our partners (and we have a number due to the complexity of the project) took about three weeks from start to finish. Thanks to amazing support from the Rees-Jones Foundation, we were able to complete the demolition and asbestos remediation while working on the closing and tax credits syndication. This allowed us to save 6-8 months on our project timeline. Now the reconstruction phase is getting underway! Tomorrow, Tuesday, August 26 at 11:00 a.m., the Central Dallas Community Development Corporation and Central Dallas Ministries will host a "Media Advisory" that will include Dallas Mayor Tom Leppert, City Council Member Angela Hunt, our partners in the project and potential residents of the building once it is completed. It will be a celebration for sure. The location? At the building--511 N. Akard! Is there just not enough to go around? Have we reached a point in our national experience that when one group does badly, other groups find that their fate in life takes a definite upturn? It's not a new question or reality if you look to the internatioanl scene. The fact is American abundance and the loss thereof has contributed to the pain and relief of people from other nations, especially in the so called Third World. Sure. And, again, not a new phenomenon, just the latest expression of same. Read for yourself how the current housing crisis among middle class homeowners is affecting our homeless neighbors in a Newsweek story by Matthew Philips, Hope Amid a Downturn. Do you get weary of the continual, almost unrelenting emphasis on and attention to external appearances? I know I do. I learned recently that one of the little girls from China who "sang" during opening ceremonies of the summer Olympics was actually lip-syncing the voice of another young girl. The girl who sang was not considered "cute enough" to appear in public, so a surrogate was recruited to stand in and pretend to sing. The "cute factor" seldom gets us anywhere of much value or substance. Life should NOT be a journey to the grave with the intention of arriving safely in an attractive and well preserved body, but rather to skid in sideways, chocolate in one hand, latte in the other, body thoroughly used up, totally worn out and screaming "WOO HOO, what a ride!" While I expect my doctor would cringe a bit and while I recognize that this adage doesn't tell it all, I love the spirit of these words! How about you? I think I might add something like this: "totally worn out, completely broke from investing in life and in people. . . ."
Got any mottoes for life that would be encouraging to others inside and outside your community? Let's hear them. Alan Ehrenhalt's essay in last Sunday's edition of The Dallas Morning News ( "Trading Places," August 17, 2008, 1P) should be required reading for leaders, city planners and anyone interested in effective responses to poverty in the U. S.
Ehrenhalt predicts that more affluent and younger residents of major metropolitan areas across the nation will continue their migration to the central cities. At the same time, the cost of housing and the associated forces accompanying the movement of the upper classes back downtown will force low-income people, including a growing number of immigrants, to move out of the inner city to the suburbs. Read his essay and give me your feedback. If Ehrenhalt is correct, the cities of America will begin to look more European, except for our ubiquitous downtown freeways. Thinking about the future of our work, it seems clear that our approach will need to be dual dimensional. We'll need to turn our eyes to the suburbs and our partners there, while working hard to carve out spaces for the poor who desire to remain in the inner city. "Snooty" is never pretty--see for yourself! The subject of my post today (below) is featured in at WFAA-TV Channel 8 news report. Amazing! Why am I surprised? Here's one for the books. If you live in the Stonebriar subdivision in Frisco, Texas, pay careful attention to the make and model when you buy a pickup. Jim Greenwood is learning his lesson the hard way. You see, Jim bought himself a brand new Ford F-150 pickup, brought it home to Stonebriar and parked it in front of his house. I bet he was proud of that new truck. I sure would be. You know, new car proud, the emotion that makes your eager to show your neighbors? Jim started receiving notices from the Stonebriar Home Owners Association (HOA) notifying him that he was in violation of the rules of the community that prohibit parking pickup trucks in driveways out front of homes. As it turns out, that's not quite true. The HOA does allow residents to park "luxury" trucks on driveways, including the Cadillac Escalade, the Chevrolet Avalanche, the Lincoln Mark LT and a few others, like Chevy Suburbans and Hummers. . .just not the standard Ford F-150. Bill Osborn, a member of the HOA board, explained, "The high-end vehicles that are allowed are plush with amenities and covers on the back. It doesn't look like a pickup. It's fancier." When Greenwood appealed, noting that his truck is not a lot different from the Lincoln, the HOA responded, "It's our belief that Lincoln markets to a different class of people." Can't believe they said that! Snooty just isn't pretty, is it? Class is a bigger issue in this nation than we'd like to admit, but then, this is not a new development. Tomorrow I'll post a note about an interesting development that is starting to play out in the nation's cities. It seems that wealthy folks are actually moving back to the central cities of America, while the poor are moving to the suburbs. Watch out, Stonebriar! The pickups are headed your way. Dr. Ron Anderson, CEO at Parkland Health and Hospital System, put me on to the work and writing of Bernard Glassman, a Jew turned Buddhist, who founded and leads the various works of the Greystone Foundation in New York City. The primary focus for Glassman and his team, beyond spiritual formation, is an incredibly innovative outreach to and among the homeless. It quickly became apparent to us that the usual approach to caring for the homeless--which was to house them in motels at great expense--was not working, and in fact could not work. Since the motels could make more money on weekends by renting rooms to prostitutes and their clients, they would routinely turn out homeless families on Fridays. Mothers or fathers didn't know where they would be when their children returned from the schools they were bussed to, and the kids whose parents weren't there to receive them after school would be taken into custody by the welfare agencies and often never returned. As a result, parents kept their children out of school. Single mothers or fathers couldn't rent apartments without money, and they couldn't get jobs without training, and they couldn't get training without child care. Given this self-perpetuating cycle, it was hardly surprising that so many succumbed to despair and drugs. Much of what passes for help is nothing more than a quick fix. You take, say, three thousand dollars and rent a motel room that puts a temporary roof over a person's head for a few nights. But the person is really being treated as garbage, that has to be hidden away for a little while. Nothing in that money helps the person get out of the cycle. It's like eating fast food instead of a real meal. You provide an immediate rush of sugar, which creates a hypoglycemic condition. Your physical state actually gets worse after a quick fix of fast food. You could, for example, take people into the country for three months and provide them with jobs, housing and child care. But if they returned to the city after that time and there were no jobs, housing, or child care, they would be back in the same cycle. Most people could see that only a holistic, totally integrated approach could break the cycle of homelessness and poverty. We had to include all the elements and ingredients of a good meal. the biggest and most immediate problem, of course, was to provide some kind of stability, which for the homeless meant permanent housing (Bernard Glassman and Rick Fields, Instructions to the Cook: A Zen Master's Lessons in Living a Life That Matters, pages 100-101). Our experience in Dallas confirms the truth of Glassman's perspective. Housing, permanent, fit, safe housing will be the key to ending homelessness in our cities. Reactions from your experience? What are groups doing to address the problem of homelessness where you find yourself today? If you haven't tuned in on T. Boone Pickens' website, www.Pickensplan.com, you need to! Interesting stuff from a guy who is usually out ahead of the curve in terms of development and what's coming next. I found one of his recent "mini-lectures" particularly engaging. Take a look at it here and tell me what you think. Thanks to Kim Horner and The Dallas Morning News for a great report on Central Dallas Ministries' Destination Home initiative in yesterday's edition of the paper! Let me know your reactions. And, if you have a moment, leave a comment on the paper's site as well. I've said it before. Let me say it again. I would put together an investment fund group and I would start a new energy company. My hiring practices would be a bit unorthodox. Most of my employees, the vast majority of my workforce, would be drawn from the inner city unemployed and underemployed. Many of my team would be ex-incarcerated and looking for a new start and a new life. I think our company could answer that call. My marketing strategy would include a new wrinkle or two as well. I'd bill our little company something like "Patriot Power." That would fit well because we would be responding to the nation's need for increased national security, while decreasing the production of greenhouse gases via the use of petroleum products. In the process, we would help grow the economy and inject new economic power into the inner city. In short, we would be helping free everyone from the need to import and burn Middle Eastern and other foreign oil while making a positive contribution to improving the environment, stimulating our sagging economy and putting people with real challenges on the right path. One huge rate-limiter would be the response of the American Congress. Making the shift to a new energy strategy and product will require subsidies and seed funding to build the necessary infrastructure and to train new workers. Would you invest in my new company? Sunday reflections for me always include time for remembering the men and women who have died during the current war. Because this war has been conducted without the broad reaching national involvement that a military draft would insure, it seems to me that we go about our business without much thought about what's going on in Iraq and Afghanistan. Current national opinion polls indicate that the number one issue of concern for Americans is the economy. Does that strike you as odd? I expect that the number one issue of concern for American families with family members and loved ones serving in this seemingly interminable conflict is not the economy. What do you think? 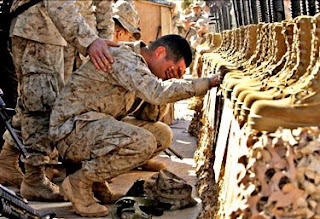 Since the war in Iraq began over five years ago, 4,144 of our troops have lost their lives in Iraq, not including casualities in Afghanistan. Over 4,000 have died since President Bush declared "mission accomplished." Over 30,000 have been wounded. Then there is the entire matter of the Iraqi war dead. Estimates range in the hundreds of thousands, including vast numbers of civilians. Every time I open this page my eye goes instinctively to the "war cost counter" to the right. I think of the funding and how it could be spent in alternative ways. Far more valuable to us all are the lives that have been and will be lost or broken. So, regardless of your opinion about the war, its strategy or its purpose; forgetting politics and ideology--let's just remember today those who are far away from home in a very tough place. Possibly change will be released as we remember and reflect. Did anyone read The New York Times report last week on the fact that 2 of 3 corporations doing business in the U. S. don't pay income taxes? Must be nice, huh? Lot's to consider, I'd say. For a moment, forget the poorest of the poor. Well, don't forget these folks, just shift your focus of concern for a moment from the human side of the challenge to the financial realities, to the costs of homelessness to any community. As we continue working on providing additional housing units for the homeless, we realize just how essential it is to make the business case for eliminating homelessness from our community. Homeless people cost us all a lot. And, many of these costs are unnecessary. The fact is, providing people decent, permanent housing is much more cost effective than allowing homeless folks to remain without housing. Recently, we conducted a survey among residents who live in housing we provide. All who responded were homeless when they came to us. All are disabled. Only 16% of those involved in our housing program took part in the survey. And while we will continue to gather data, what we collected in this initial survey provides a very clear "trend line" for our consideration. 1) In the year before you came into the Destination Home program how many times did you visit a hospital emergency room for any kind of treatment? 2) In the year before you came to the program, how many times were you admitted to the hospital? 3) How long had you lived in your Destination Home apartment? 4) Since you moved into the Destination Home program, how many times have you visited a hospital emergency room for any kind of treatment? 5) Since you moved into the Destination Home program, how many times have you been admitted to a hospital for any kind of treatment? The results are extremely interesting. Those who participated in the survey have been in the program for an average of 9 months. Their average age is 57. In the year prior to coming our way, these folks report 17 ER visits at local hospitals. Since coming to our program, they report 1 such visit. Likewise, in the year prior to coming to Destination Home, those surveyed reported 4 hospitalizations. Since coming to us, survey participants reported 1 hospitalization. Clearly, permanent housing makes a big difference for the formerly homeless. But, it also makes a difference for the rest of us. Ignoring the poor is not only heartless and immoral, it makes no sense whatsoever financially. Good public stewards will invest in wiping homelessness out. I'll just call him "Mr. B." 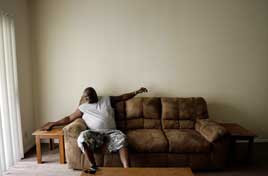 He's been living in an apartment out in North Dallas that we've been able to provide him, thanks to a funding stream from the U. S. Department of Housing and Urban Development (HUD). Like all of our tenants in "Destination Home," Mr. B is disabled. He endures many physical maladies with great grace and amazing courage. As a matter of fact, Mr. B has taken on the role of leader of our little community inside this one apartment complex. Everyone knows him, and he knows everyone, their issues, history and needs. Not long ago, during a tour with some interested folks, the subject of access to reliable transportation came up. Mr. B and others explained that tenants enjoy easy access to DART (Dallas' rapid transit system). Then, he went on, "Yeah, I catch the DART at least once a week and ride down to a nursing home on MLK where I visit folks who don't have anyone else visiting them." "That's great," I told him. "Is this a program of your church?" I asked. Mr. B recently joined the New Mount Zion Baptist Church, one of the churches that supports our efforts in Destination Home. "No, it's not. I've been doing this for years now." Mr. B, chronically homeless and disabled, has been visiting "shut ins" in a South Dallas nursing home for years while living on the streets of Dallas. As Americans we need to "re-frame" our understandings of our homeless neighbors. I've known that for a long time. Mr. B takes the discussion to a whole new level. 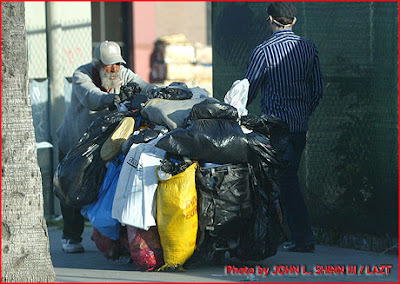 The problem is that we don't really know, I mean know, anyone who is or has been homeless. I think we ought to work on that. How about you? I can tell you for sure, as we do so, we are in for some real surprises. People often ask me, "How did you know what to do as Central Dallas Ministries developed?" Or, "How did you decide what to do to realize the growth that CDM has experienced over the past 15 years?" With a very simple answer: we didn't! I guess you'd have had to have been here pretty much full-time to understand. One thing I've learned here is that at least 80% of everything related to progress is found in simply "showing up." My experience tells me that Bernie is right. On to the next thing then, okay? One of the realities that we have encountered in our work among our inner city neighbors is a rather obvious disparity in treatment, access and outcomes when it comes to health care options and delivery. Health care professionals have recognized these disparities that cut along class and racial lines. The Baylor Health Care System, one of our most important and committed partners in the city, has an entire department devoted to addressing disparities, the Office of Health Equity that is led by our friend and CDM Board member, Dr. Jim Walton. The issue is a very serious concern. That's why Kevin Sack's recent report in The New York Times (June 10, 2008) caught my eye. What he reports is serious. Rather than summerize it, I'll just let you read the entire article, "Doctors Miss Cultural Needs, Study Says." As researchers ponder growing evidence that blacks have worse outcomes than whites in the treatment of chronic disease, they often theorize that members of minorities suffer disproportionately from poor access to quality care. Now a new study of diabetes patients has found stark racial disparities even among patients treated by the same doctors. The lead author of the study said in an interview that he attributed the differences less to overt racism than to a systemic failure to tailor treatments to patients’ cultural norms. The problem, said the author, Dr. Thomas D. Sequist, an assistant professor of health care policy at Harvard Medical School, may be that physicians do not discriminate in the way they counsel patients. For instance, he said, counseling black or Latino patients with diabetes to lower their carbohydrate intake by cutting rice from their diets may not be a realistic strategy if rice is a family staple. In the study, which was published Monday in The Archives of Internal Medicine, Dr. Sequist and his colleagues examined electronic medical records of 6,814 patients with diabetes. All were treated from 2005 to 2007 by at least one of 90 primary care physicians with Harvard Vanguard Medical Associates, which has 14 walk-in health clinics in eastern Massachusetts. Each doctor treated at least five white patients and five black ones. The researchers looked at three standard measures of effective diabetes control: blood pressure, LDL cholesterol levels and hemoglobin A1C, which reflects blood sugar. Though similar proportions of black and white patients took each test, fewer black patients adequately controlled their levels on all three measures. The glucose test found, for example, that 71 percent of white patients and 63 percent of black ones were adequately controlling their blood sugar levels. Socioeconomic factors like income or insurance status explained 13 percent to 38 percent of the racial differences, the authors calculated. But they found much larger racial disparities — from 66 percent to 75 percent — in patients who were treated by the same doctor. Adjusting for clinical differences among patients did not change the findings. “Racial differences in outcomes were not related to black patients differentially receiving care from physicians who provide a lower quality of care, but rather that black patients experienced less ideal or even adequate outcomes than white patients within the same physician panel,” the study concluded. To attack such disparities, the authors recommended that doctors and other members of the health care system learn more about minority communities and that patients receive better education about diabetes and how and why it must be controlled. I'd love to get your reactions. 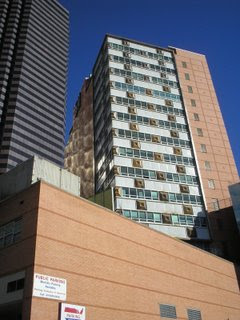 Formerly homeless men and women now occupy forty-six of our 50 apartments. Our negotiations continue on a contract with HUD that will provide 55 more apartments. Each of the men and women living in our apartments deal with disabilities of one kind or other. What's really cool is the simple fact that we are all becoming good friends. We call the project "Destination Home." Last week, Kim Horner, a reporter with The Dallas Morning News, stopped by to visit with our staff and our tenants about the program. "The best thing about this is the fact that they give us our freedom. It is unlike any other program I've been involved in. They gave us an apartment and left us alone. The freedom makes us realize that we have to be responsible and we hold each other accountable." His words may provide one of the best insights into our "housing first" philosophy. If a person is homeless and disabled and if they agree to complete a lease agreement required by the property owner, they are eligible to receive an apartment. Basically, that is the program. There are no other prerequisite requirements--no classes, no group meetings, no curfews, nothing beyond what anyone would need to do who leases an apartment on their own. Just be a good tenant, abide by the lease terms and enjoy the community. Yes, we have staff on site ready to assist the tenants with their needs. But, the tenants must request our involvement. If they want to participate in our activities or seek other services through our team, they are welcome to do so and we are pleased to help. Our experience tells us that the national research we've seen is true. The vast majority (over 85% in at least one study) of homeless persons do not require much beyond a place to live to see their lives stabilize. Tears flowed in our little meeting last week. Smiles and laughter filled the room. People are just really glad to have a home. So glad that almost all of our tenants are approaching us to see what they can do to help with our efforts to make their larger housing environment a true community. In this process giving goes in every direction. The property management tells us they are very glad to have our tenants in their apartments, and they are looking forward to leasing us more as the funding becomes available. We intend to provide as many housing units as possible. Our focus will continue to be housing, rather than service. Freedom is the key. Want to read an extremely thoughtful and moving analysis of black preaching and the place of the African American church in national life and thought? Want a clear-headed assessment of what's up in America's black churches? Read what my friend and partner, Gerald Britt writes in the latest issue of New Wineskins e-magazine. Thanks to KERA 90.1 FM for publishing the text of "Dr. Caesar Clark - A Remembrance" by Rev. Gerald Britt, CDM's VP of Public Policy and Community Program Development. The text and audio are both available here: http://publicbroadcasting.net/kera/news.newsmain?action=article&ARTICLE_ID=1331124§ionID=1. Listen in to gain a rich perspective on Dr. Clark's life and legacy, as well as a deepened understanding of the place of the African American Church in Dallas and the nation. For more on Dr. Clark visit Gerald's blog at: https://www.blogger.com/comment.g?blogID=690663941436597612&postID=7123102142307615158. Or, visit the YouTube site at: http://www.youtube.com/watch?v=gKw3h9xsIkk. Great insights on a man who will be missed in our city. As the era of a plentiful workforce wanes and the "baby boomers" begin to approach retirement, the US economy has found numerous ways to sustain growth and prosperity. These approaches include. . .an increasing reliance on immigrants, both legal and undocumented. . . .The relative increase in the immigrant share of the overall population in the past few decades, the greater reliance on undocumented workers, and intense political attention have often camouflaged the fundamental economic concerns. . . . The development of immigration policy affects not only national security and other priorities, but also the economy. Overly restrictive policy has the potential to devastate certain industries which would be faced with near crisis conditions in terms of affordable labor. . . .If all undocumented workers were removed from the workforce, a number of industries would face substantial shortages of workers, and Americans would have to be induced into the labor pool or provided incentives to take jobs far below their current education and skill levels. For this phenomenon to occur to a meaningful extent, substantial wage escalation would likely be necessary, thus eroding competitiveness in global markets. As the domestic workforce becomes older, more stable in number, and better educated, the US production complex increasingly requires foreign, low-skilled workers. The economy is now relying on more low-skilled immigrant workers than the allowable work visas under current policy. In 1960, about 50% of men in this country joined the low-skilled labor force without completing high school; the number is now 10%. . . .The total demand [for low-skilled workers] will far exceed the rate of growth in the workforce that will occur from natural expansion and the entry afforded by current immigration policy, leaving a potential gap of tens of millions of laborers. Even if some marginal workers are induced into the workforce from other sources, the need for an immigrant pool to perform these functions is likely to increase. For several industries and occupations, undocumented immigrants serve as a particularly important source of labor. These include private households, food manufacturing, farming, furniture manufacturing, construction, textile manufacturing, food services, administrative and support services, accommodations, and selected elements of the manufacturing industry. Want to keep up with the latest breakthroughs, challenges and issues here at Central Dallas Ministries? 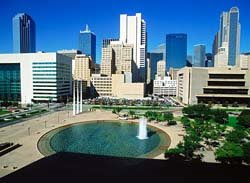 Check out our new weblog at: http://centraldallas.blogspot.com/. Thanks to Jeremy Gregg, Director of Philanthropy, for getting this site up and for maintaining it for us. I think that looking in here will give anyone almost real time access to the churning world of CDM! Love to have your feedback! "There are no statistics on the street." The thermometer in the car read 113. It felt hotter. At 3:30 p.m. we were just getting around to having lunch. The walk across the parking lot felt like a sauna complete with built-in aerobics. Not sure how accurate the instrument was, but clearly, well over the century mark. My mind went to the street. What's it like "out there" when it's this hot? Even in the new homeless assistance center, The Bridge, Downtown there wouldn't be enough cool spots to accommodate the crowd. Looking for shade. No place to shower or rest or use "the facilities." Our Resource Center building on Haskell Avenue that doubles as our headquarters is now surrounded by Baylor University Medical Center development. The last pieces of the build out include a surface parking lot directly behind our building that wraps around us to the northeast and a multi-story administrative office building and parking garage just across Crutcher Street to our southwest. Watching the construction has become a daily enterprise as we come and go from our offices. I've been amazed by the pace of the construction. I've watched the labor closely. Mostly Hispanic gentlemen who demonstrate great skill and impressive work ethic, to say the least. I've also noticed that they remain focused and cheerful. One day recently, I watched as two men took alternating turns with two sledge hammers driving what started as a 5-foot stake in the hard dirt of the parking garage site. As they finished, I cheered them on. We shared a laugh and a brief exchange. Friends in the heat, whether at work or just trying to survive difficult circumstances. Economist Ray Perryman (http://www.perrymangroup.com/) knows about as much about the Texas economy as anyone who makes a living studying it. The Perryman Report is consulted by policy makers, business leaders and academics who share a concern for economic forces and the reality facing Texas citizens, consumers, labor and employers. The Perryman Report & Texas Letter (March 2008) contains an important essay, "An Analysis of the Economic Impact of Undocumented Workers on Business Activity in the US with Estimated Effects by State and by Industry." Noting the concerns of a shrinking workforce brought about by the aging of the Baby Boomers, Perryman is keen to impress upon his readers, no matter what their ideological or political positions, the central role of immigrants in helping sustain and grow the American economy. Perryman regards "enforcement-only" strategies and responses to undocumented immigrants as inadequate and naive in light of economic reality. As he says early in his report, "Overly restrictive policy has the potential to devastate certain industries. . . . While a national reform initiative is imperative, it must be cognizant of the potential economic fallout in order to avoid unnecessary disruptions, dislocations, and unintended consequences" (page 1). Between 50 and 75% of undocumented immigrants pay federal, state and local taxes. Undocumented workers pay "far more" in taxes than they receive in benefits from various governments; while some state and local entities experience a net loss in cost of benefits versus taxes paid. "Viewed on the whole. . .the group more than compensates for the services it receives" (page 3). Removing all undocumented workers would result in $1.757 trillion in annual lost spending, $651.511 billion in annual lost labor output, and 8.1 million job losses. After the U. S. economy "adjusted" to such a loss of labor and capital, Perryman estimates that the sustained losses would include $551.569 billion in annual spending, $244.971 billion in annual labor output and more than 2.8 million lost jobs. The economic and labor data line up well with my personal experience in inner city Dallas. We must craft policies that provide guest worker status to immigrants who simply want to work, make a contribution to the U. S. economy and better their lives and those of their loved ones. Doesn't that sound thoroughly American? Another important election year is approaching and we hope you will join us in ensuring everyone's voice is heard. Several national organizations* are holding a conference call on Wednesday August 6 at 3:00 pm ET to discuss the many ways your organization can get involved with National Homeless & Low Income Voter Registration Week, September 21-27, 2008. Please note the new access code 15392836#. You will be able to click on a link to access the call via the web. Since equal access to the right to vote is a crucial part of maintaining a true democracy, nonprofits and service agencies nationwide will dedicate the week toward registering homeless and low-income individuals to vote. For those unable to conduct voter registration drives, the week can also be used to educate community members on the election process. For more information about getting involved with voter registration, education and mobilization from the National Low Income Housing Coalition click here. Please RSVP for the call by emailing outreach@nlihc.org. Check out the new weblog, "Change the Wind" (http://www.changethewind.org/). You'll get into the hearts of my partners, Rev. Gerald Britt and Jeremy Gregg. Great site! I love reading what's up there. We need to hear your reactions! God, who is Creator, care-giver and challenger, the heavens truly declare your glory, and the skies your handiwork, though we must confess that most of the times we city dwellers are shielded from that knowledge by the bright lights with which we surround ourselves. Our artificial lighting comforts us in the darkness and allows us to pretend that our creations and our work is all that matters. But this summer some of us have ventured out to the desert or mountain top or some deserted beach and looked up and seen your glory splashed across the skies. Some of us have even stopped to think that the mist which stretches across the night sky which we call the Milky Way can be resolved by a good telescope into hundreds of billions of stars. Then we have asked with the psalmist, O Lord, what is man that you are mindful of him, or the daughter of man that you might care for her? Yet you have made us but a little lower than the angels and set us the task of nurturing and caring for our small part of creation. And that’s the problem. We have taken the garden you have given to our care and used its waters for sewers, its land for a garbage dump, and its creatures for target practice. It’s really no surprise after all, Lord. How can we be expected to nurture the creation when we won’t even treat each other with respect? When we tell the poor to get a job, and won’t pay a living wage, when we tell the sick to get well, and refuse them health care, when we tell the prisoners to reform, and refuse them employment when they do. How can we ever love our neighbors when our response to those who strike out against oppression is to shoot first and ask questions later? But that’s why we’re here this morning, Lord. We have heard rumors of the good news which says it is possible to alter our course. We have heard stories of Jesus and the amazing power of his love – power to change people like Peter and Paul, Magdalene and Helena, Augustine and Luther, Wesley and Asbury, Mother Theresa and Martin Luther King, Jr., and even some of our neighbors. Power to recreate us in your image. So we pray for the gift of your Holy Spirit to come upon us, that we might not be conformed to this world but be transformed by the renewal of our minds and hearts, that we might live out the good and acceptable and perfect will of God. Our Father, who art in heaven, hallowed be thy name. Thy kingdom come. Thy will be done on earth as it is in heaven. Give us this day our daily bread, and forgive us our trespasses as we forgive those who trespass against us. And lead us not into temptation, but deliver us from evil. For thine is the kingdom and the power and the glory, forever. Amen. Commitment to changing the systemic factors that keep people down and out is a necessity, if the goal is sustainable, authentic progress. Dorothy Day's diary reflects her determination to work for change. These words were entered in summer 1938. The struggle continues. We had a meeting of the friends of the CW [Catholic Worker] and there were an equal number of colored and white. The colored confessed to giving up when they discovered the new housing appropriations were not going to reach them. A great need for people to unite and work for their poorer fellows. They can be meek for themselves but not for others. St. Thomas says a man cannot lead a good life without a certain amount of goods. It is impossible for people to keep straight, living under such conditions. Whole families crowded in one room, people living in shacks in the open, vice rampant, it is a miracle if children remain uncontaminated. I would suggest the tenants go on a sit-down strike against paying rent, and so call attention to their situation. The first small step is to get water for them. Housing, interracial justice and cooperation are the three things the friends of the CW in Harrisburg [PA] are interested in. And they have already done much along these lines. Along with this work, they are also talking about a farm to settle about five young men, two married with families, the others working to make marriage possible. With an auxiliary group to help them, with those who are working helping those who are not working, much can be done. Mutual aid, without help or interference from the government. Working along both lines is necessary.